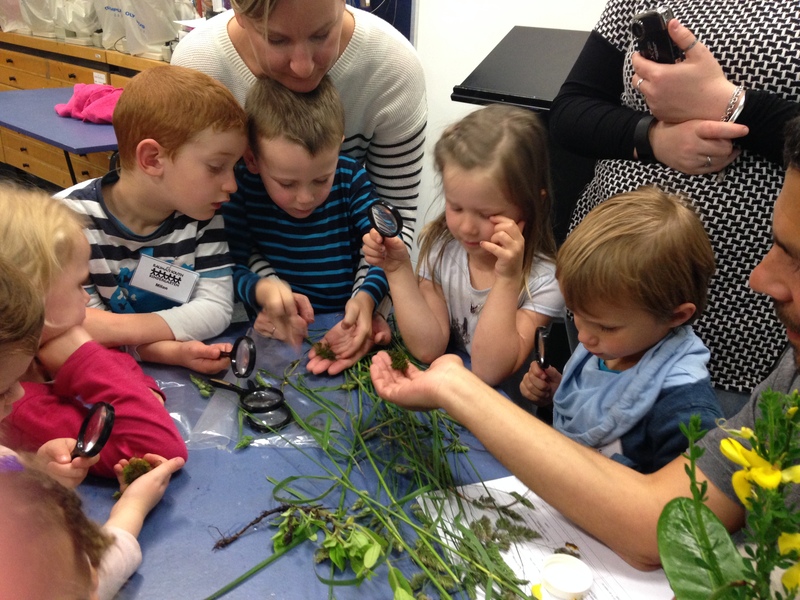 Throughout 2015, young children from three Wellington regional Early Childhood Centres (ECE) have been thinking and working as scientists as part of the ‘It’s a Bugs Life’ partnership project with Te Papa Education. In celebration of the mahi (work), their teachers and educators from Te Papa arranged for the children to come and meet with more experienced scientists working here at Te Papa. 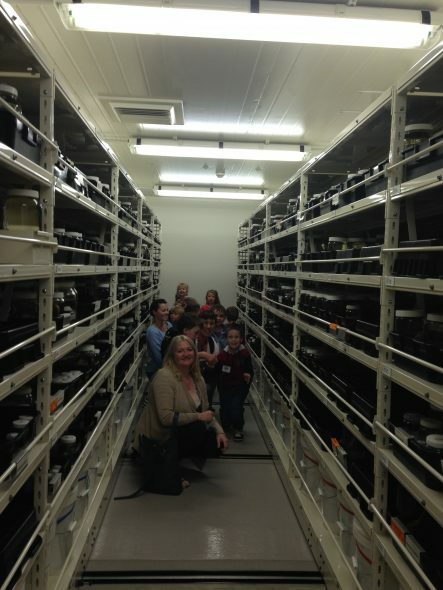 In doing so, the children would get to go behind the scenes, seeing the amazing collections they work with, and the special lab areas they work in. Our ‘lucky last’ group to take part was Raumati South Kindergarten, who travelled for more than an hour (!) on the bus from the Kāpiti Coast to meet our scientists Phil Sirvid, Andrew Stewart, Leon Perrie, Carlos Lehnebach and Antony Kusabs. The entire Tui Group (made up of 40 four year old children) attended, along with their teachers and many wonderful parent helpers. Due to the large numbers, the children were split into three groups who had 15-20 min sessions with the different scientists or specialisms. 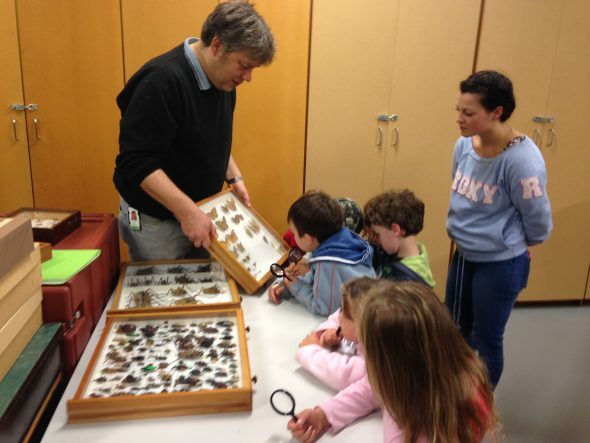 Phil, our spider expert, was also charged with showing the children some of Te Papa’s insect collections today. 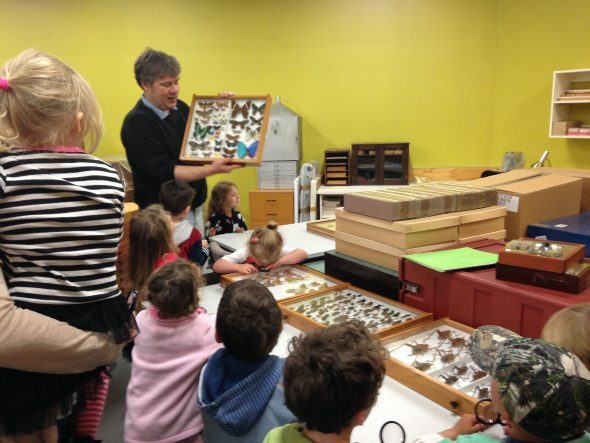 Raumati South Kindy has a real interest in butterflies and moths, so the children were very excited when he showed them some of these specimens. The children noted they had never seen moths that big before! Phil explained that some butterflies have a leaf like patterning and colouring on the underside of their wings so they can hide from predators, like birds. 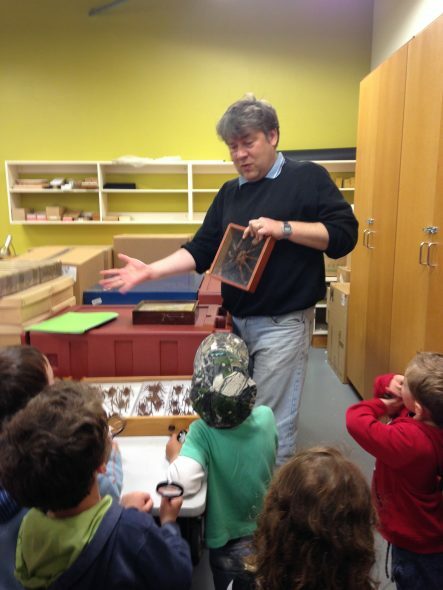 Phil’s tarantula was a big hit once again. It is a Goliath birdeater, which makes it the biggest spider in the world! The children found out that this spider doesn’t make webs to catch food, and neither does the common New Zealand species, the jumping spider. 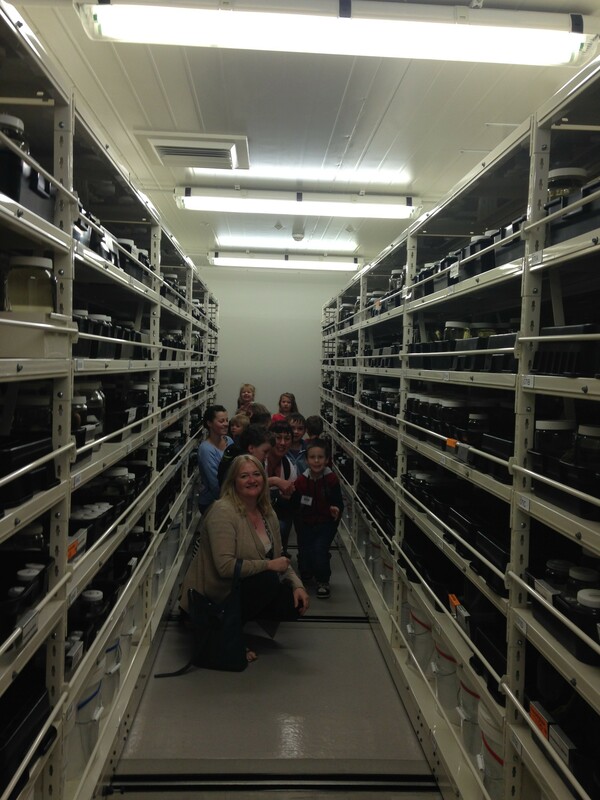 Andrew took the children into the Spirit collection first up, to see all of the many fish specimens kept there. He explained that the area was a bit like a library, but of fishes rather than books. The children noted that there were many different sizes of jars to account for the different sized fish. In the fish lab, Andrew put on a glove for safety (as the ethanol the fish are stored in will hurt his hands otherwise), and took a selection offish out of their jars so that the children could get a closer look. 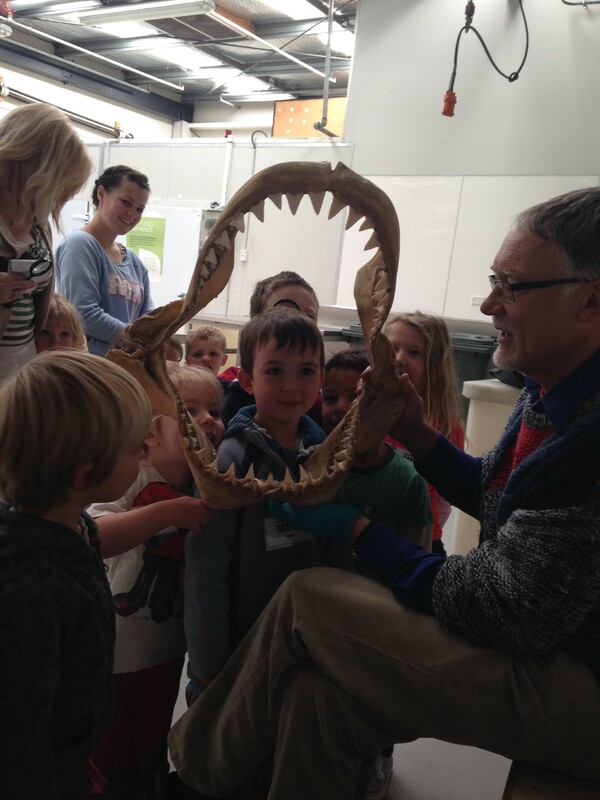 The children were very impressed by the large shark jaw that Andrew had brought into the Fish Lab to show them. Andrew showed the children all the rows and rows of teeth behind those in the front. A shark would get a lot of money from the tooth fairy, that’s for sure! 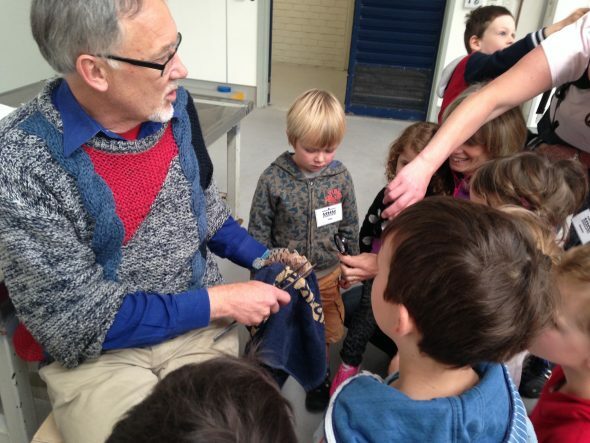 Many of the children from Raumati South Kindy are keen fishermen, and so discussion about the biggest caught ensued. One of the children used his hands to show how big a Snapper he and his family had caught. Andrew said that there is a Sleeper shark in the collection that would reach from the ceiling to the floor! The children and adults were also pretty impressed that the book that Andrew, Clive Roberts and Carl Struthers have written on New Zealand fishes: The Fishes of New Zealand, weights a whooping 11kgs! This is around the same weight as some of the smaller children from the Tui Group! 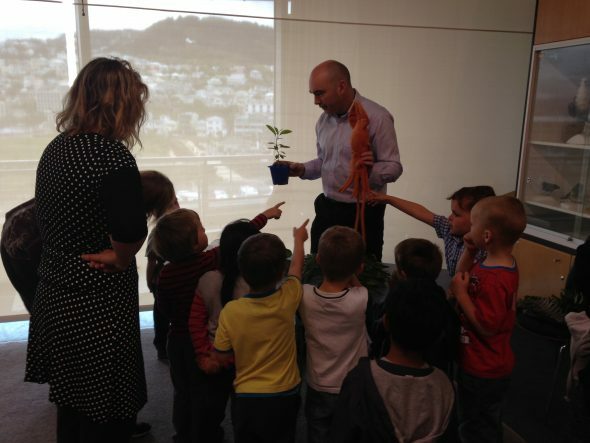 Some of the children from Raumati South Kindy have a real interest in space. As a special surprise, the Te Papa Educators set up the StarLab digital planetarium in the Tory Street tearoom, so that we could explore the stars and planets together. 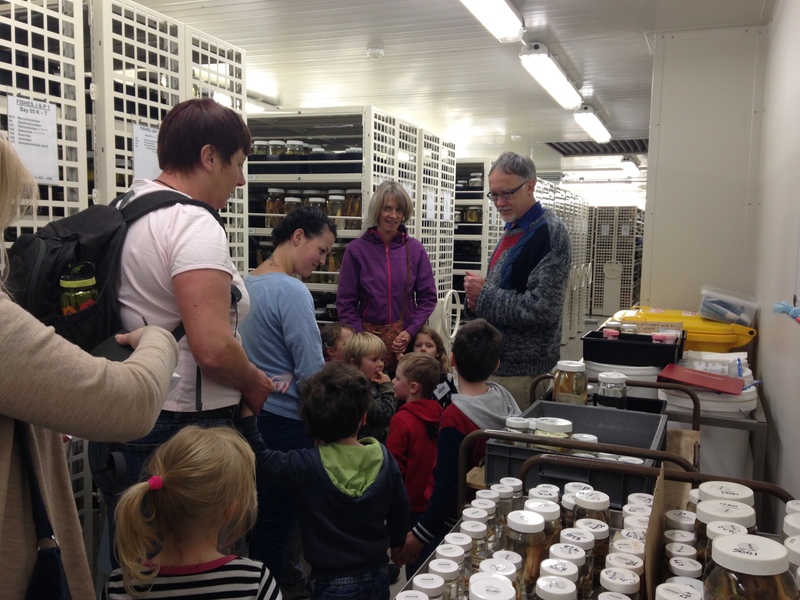 The whole group came own to Cable Street for their last scientist visits with members of the botany team: Leon, our fern expert; Carlos, our orchid expert, and Antony, our collection expert. 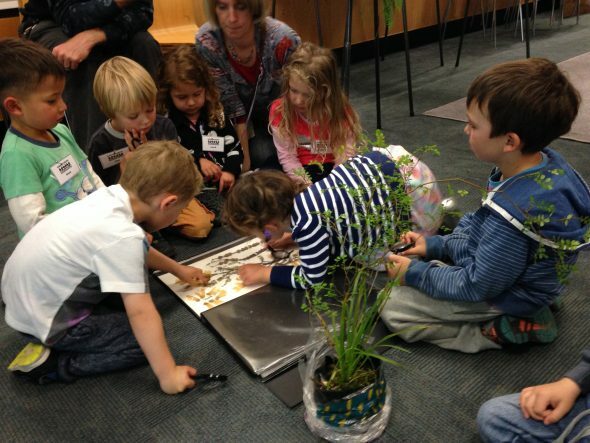 The scientists started by talking to the children about what plants are, and what makes them different from other organisms. Leon, Carlos and Antony wanted the children to know that plants come in all shapes, sizes and textures, and so they brought in lots of different types of plants for them to touch, smell, and look at. This included grasses, cactus, ferns, mosses and orchids, and leaves from deciduous plants (those which lose their leaves, usually in autumn) and evergreen plants (those that have their leaves on all year round). Some of the leaves Antony showed the children differed in texture: some where waxy and smooth, and others were hairy and rough. The children rubbed them on their cheeks to compare. We had a think about why some plants have hairy leaves and why others don’t. 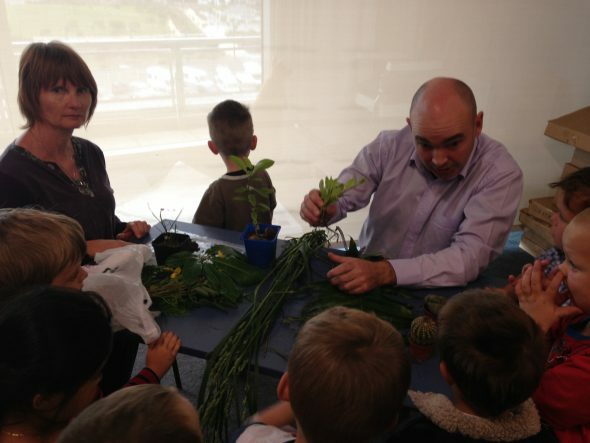 Antony asked the children if they could use their observation skills which they have been honing throughout the It’s a Bugs Life project to help him identify the type of plant he had in his pot. 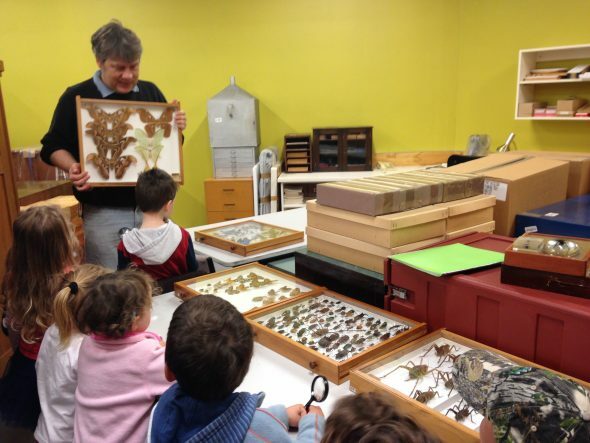 They used pressed and dried specimens just like botanists do to try to solve the mystery. Carlos showed the children some of the spider orchids he had collected, and they had the opportunity to pass them around and look closely with their magnify glasses. The children also enjoyed looking closely at moss, smelling the grasses (their flowers had the children thinking the grass might be lavender, but a smell test confirmed it wasn’t so), and talking about the adaptations of cactus. 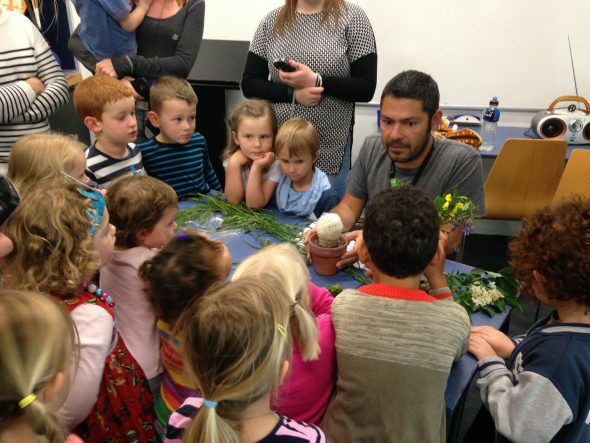 Leon showed the children a silver fern, which is not actually silver but a white colour on it’s underside. The children knew that the All Blacks have a silver fern on their jersey, and Leon explained it is because this fern is special – it only lives in New Zealand. The children had a great time comparing and contrasting the spore shape and arrangements on different species of New Zealand ferns. After this big morning of science, the tamariki (children), kaiako (teachers) and mātua (parents) all had some much deserved lunch, and hopped back on the bus for their long journey back to the Kāpiti Coast. It has been a real pleasure having all three of our ECE groups come visit with our sciences behind the scenes at Te Papa. 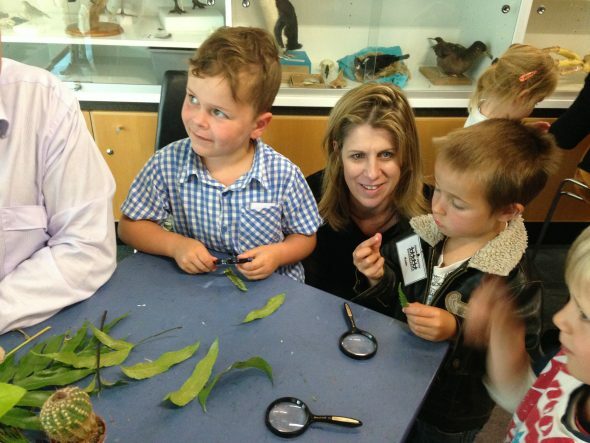 It has really reaffirmed just how capable and competent young children are as science learners. Check out our earlier posts about the Scientist meet Scientist visits of Imagine Childcare and Kiwi Kids ECE too. 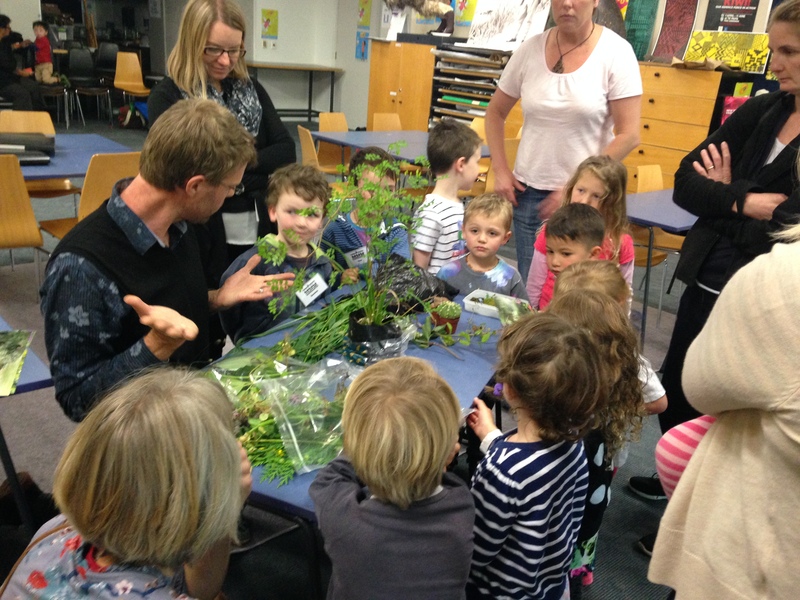 The ‘It’s a Bugs Life Science Education Resource’ – the major output of this project – will be released in Term 1, 2016 and distributed around ECE centres and schools throughout Aotearoa. Thank you for a great day, your organisation of our trip to Te Papa was much appreciated; thank you for making our trip a success. On our return children and adults were tired but motivated by the learning experiences that they had during the day. This has inspired further investigation and exploration.